Problem-Attic has made the writing of math and science questions faster than ever! An option for “live” or inline math provides all kinds of shortcuts plus automatic on-screen preview. Note: the math editor is a subscription feature in Problem-Attic. However, you can use it as often as you like, free of charge, in what’s called the Play Area. Click here to learn more. For a quick reference, which is printable and which shows the easiest commands to type, download this charts. Inline vs. pop-up math editor. Problem-Attic’s pop-up editor works the same as before. 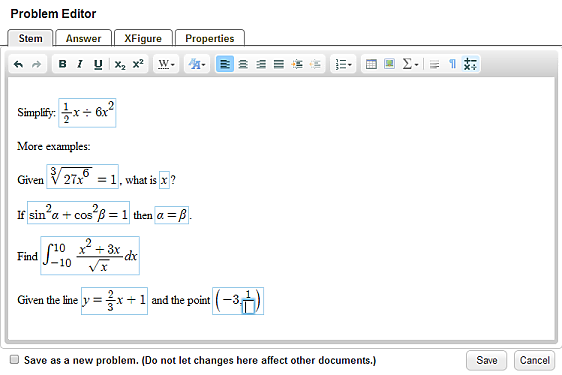 To access it, click the insert math icon in the toolbar of the problem editor. It supports a full range of commands and is palette-based, which means you can click on visual images of symbols if you forget or don’t want to type the commands. Significantly, code is not shared between the inline and pop-up editor, so you have to decide which to use. (At a low-level, they work pretty much the same way.) If you’re typing a long formula which is easier to read on multiple lines, or if you need to type a more complex formula like a matrix or system of equations, then you should go straight to the pop-up editor. That’s it for instructions. Please go try the math editor and let us know how you like it. You can write to us at support@problem-attic.com.